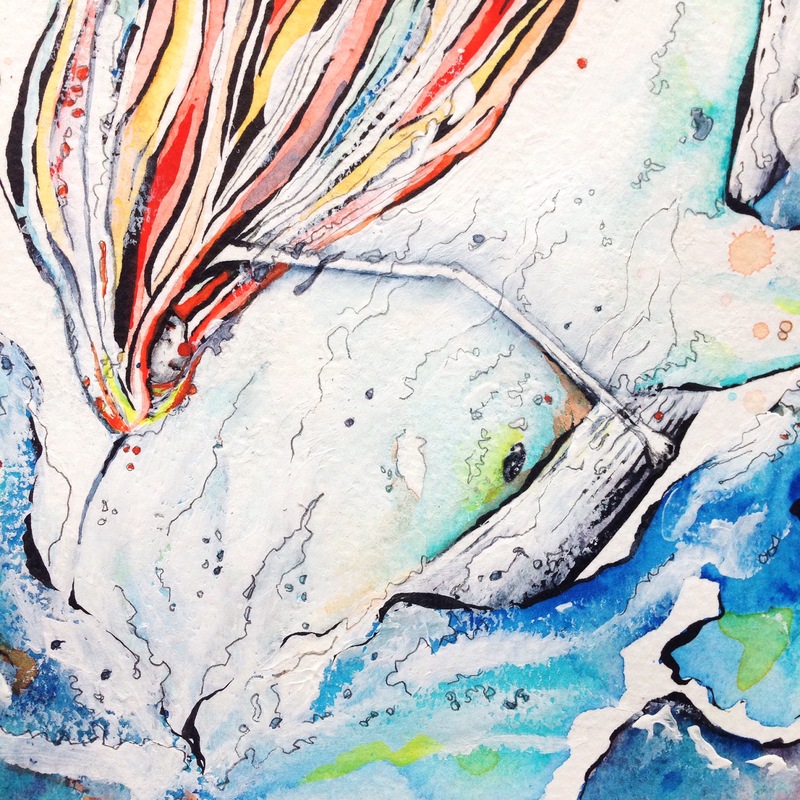 Flow, my latest watercolour painting is complete! I have been working on this piece for a few days and am happy to have finished it in time for the next auction beginning September 6. I just recently shared on my Instagram feed yesterday about challenges I face when creating. If you look for the pictures below in my feed you will find it. Yes, that’s right! I used ink! I’ve been wanting to use my Pentel Brush Pen for a long time on my auction work but just didn’t have the nerve. You cannot erase ink. Even watercolour is something that can be fixed to a point but not ink. The great thing about the brush pen is that it really does act like a brush! Depending on your pressure on the brush you can make super thin lines or thick ones and they really create a fabulous movement for the hair. I loved it so much I used it for parts to the water too! I admit that I did arrive at a point where I was not sure how to continue. I really liked the ink but it was a bit too much in places so I added some white acrylic paint with my finger over her hair, the waves, and the whale. I still wasn’t happy. I knew then it was time to take a break. An hour or so later I grabbed my trusty 0.3mm pencil lead and just started adding in details like I always do. I really wanted to try using only ink this time around but felt myself coming back to the pencil. I began tracing over grooves that the white acrylic paint left in the paper. 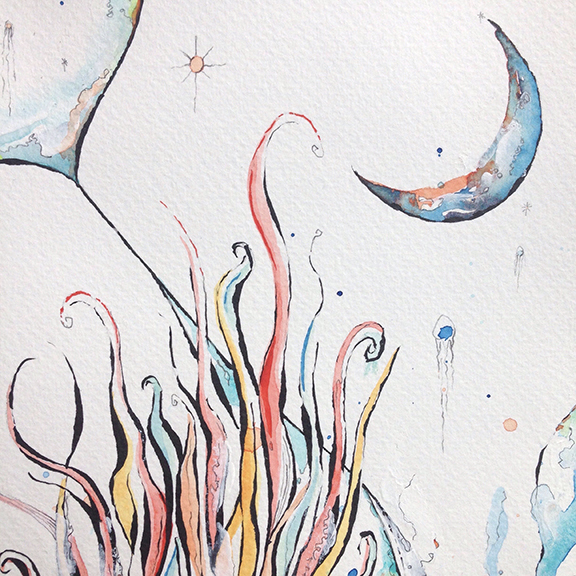 I added some stars and ocean creatures to the paint drips and really like the way they turned out. 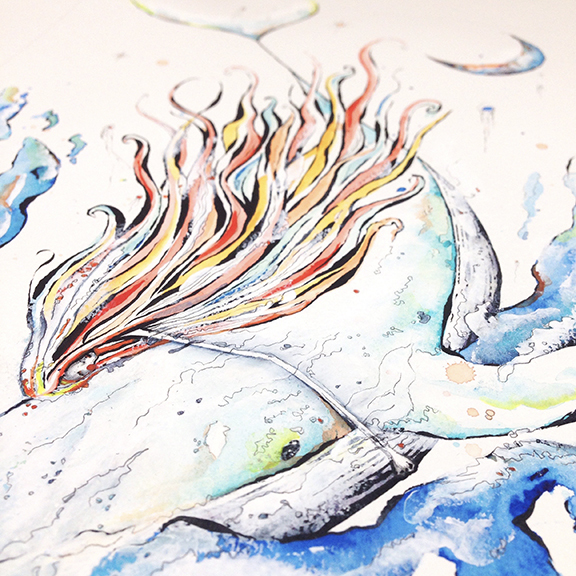 Plus, the pencil marks along the whale’s front look like frothy water splashing up and adds more movement to the piece. Gotta love little surprises like that! The details are what make a painting. Details and patience! I’ve said it before and I have to say it again. As much as I try to simplify my work I just come back to the little details and sometimes I only see this once I’ve stepped back from the painting and given myself time to just let it sit. The final painting is sized 9×11 on watercolour paper. It can easily be matted to 8×10. Happy creating and hope to see you at the auction! Previous PostNew art supplies I’m excited to share with you! Next PostSpecial Equinox Moongirl Art Newsletter!